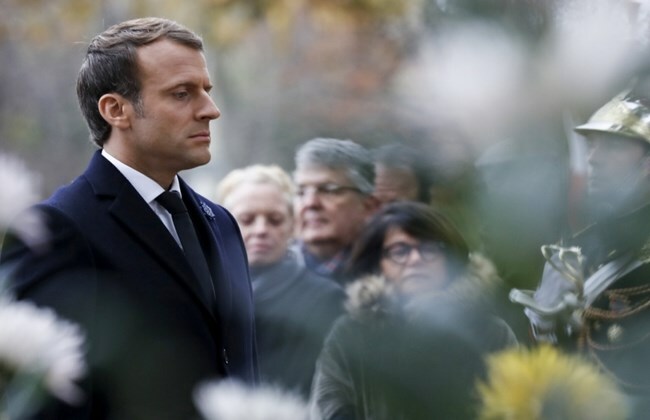 (David Chazan, in Paris Christopher Hope, Chief Political Correspondent, in London Camilla Tominey, in London, UK Daily Telegraph) – French President Emmanuel Macron has provoked a row by ordering that ceremonies in France marking the centenary of the end of the First World War next month must avoid commemorating it as a military triumph. Sixty heads of state and government including US President Donald Trump are to attend ceremonies in Paris on Armistice Day, November 11. The French president will make a speech at the Tomb of the Unknown Soldier beneath the Arc de Triomphe. But Mr. Macron’s office said an “overly military” ceremony would risk offending the French, who now view the First World War as a “mass slaughter” rather than a glorious victory. An Elysée Palace source said: “The combatants were mainly civilians who had been armed.” About 40 million soldiers and civilians died in the four-year conflict. Mr. Macron decided to downplay the November 11 commemorations communicated to Angela Merkel, the German Chancellor, who agreed. …The French President was keen to avoid any homage to Marshal Pétain, a French hero of the First World War who is reviled for his later role as head of the Vichy government that collaborated with the Nazis during the Second World War. Bénédicte Chéron, a military historian and author, said the Elysée was making a faux pas. Mr. Macron was criticized in August for failing to interrupt his holiday to join Theresa May and the Duke of Cambridge (Prince William) at a ceremony in Amiens, his home town, on the centenary of a battle that marked the beginning of the end of the First World War. The British Government has been invited to attend and will send a “senior Government minister,” the Foreign Office said last night. Last night spokesman said: “The UK Government has been invited to the Armistice centenary commemorations in France and a senior government minister will attend. Royal sources said it was likely that the Queen, with the Prince of Wales, the Duchess of Cornwall, the Duke and Duchess of Cambridge, and the Duke and Duchess of Sussex will be at the Cenotaph [WWI war memorial in London]. Instead more junior members of the family such as the Duke and Duchess of Gloucester or the Duke and Duchess of Kent are likely to attend. Lord Dannatt, the Chief of the General Staff from 2006 to 2009 who has sat on the UK Government’s World War One advisory board since 2013, welcomed President Macron’s tone. Published at the UK Daily Telegraph on October 22. Reprinted here for educational purposes only. May not be reproduced on other websites without permission from the Daily Telegraph. b) Why did President Macron make this order? c) How many world leaders will attend the ceremony commemorating the 100 year anniversary of the end of WWI? d) Michel Goya, a historian and former infantry colonel, accused President Macron of “insulting the soldiers of 1918.” What do you think: does Macron’s order insult those who fought and died in WWI? Explain your answer.